Zeta One – Dreamsnake II, a solo project of one the all time ginchiest gals of the Whittier, CA area (miss Dawn Aquarius) is now out. When I say out I mean like way out…of this galaxy even. Dawn has always been one of those creative creatures that’s simply terrific at everything she gets her palpable paws into and always has been. She is one of the most authentic and talented artists in the world. If you don’t believe me, let me clue you in on her cosmic comic book, Acid Ankh, already a classic. Dreamsnake II is a groovy blend of mod, psychedelia, 70’s synth and noise. You’ll be slated for Zetaville with the first track, “Dreams of Creation.” It only gets more happenin’ from there, with hypnotic jams like Spectrum 5 …and my personal fave “Zephyrus,” which swings like sixteen. Dreamsnake II appears in the form of a Limited edition cassette. Only 100 are available. Who knows how many even remain now? 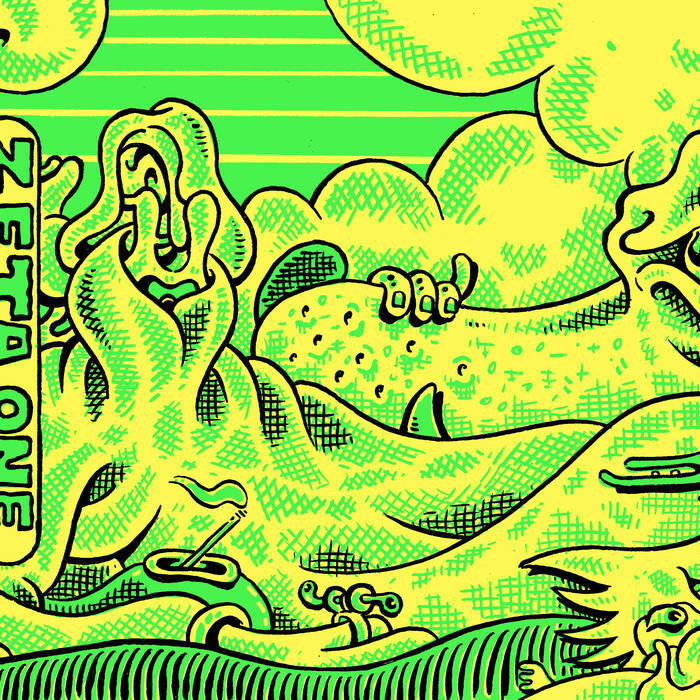 They come with black and green screen prints on yellow stock, with art by Max Clotfelter . The release is through Eidertown Records, in Seattle, WA.